Another sexual harassment scandal is blowing up at Fox News with host Bill O’Reilly at the center. As media figures and advertisers distance themselves, the famously abrasive TV personality seems to have some dubious yet powerful support from the top spot inside the White House. Another sexual harassment scandal is blowing up at Fox News with host Bill O’Reilly at the center. As media figures and advertisers flee, the famously abrasive TV personality has some dubious yet powerful support from the top spot inside the White House. 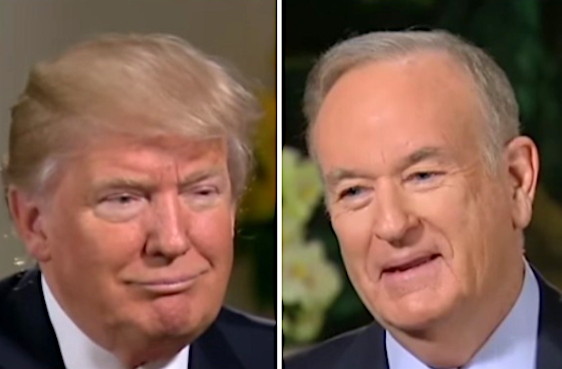 In an interview with the New York Times this Wednesday, President Trump came to O’Reilly’s defense regarding the 5 women accusing him of sexual harassment. As of now, the total sum of lawsuits brought against the Fox host is about $13 million. When former Fox chief Roger Ailes’ penchant for sexually harassing his female employees came to light in the summer of 2016, Trump defended him as well. “It’s very sad. Because he’s a very good person. I’ve always found him to be just a very, very good person. And by the way, a very, very talented person. Look what he’s done. So I feel very badly,” Trump said regarding Ailes, according to The Huffington Post. More than a dozen women have accused Trump himself of sexual assault. Trump called them liars and threatened to sue them after the 2016 presidential election ended, but so far has taken no legal action. Regardless of how long O’Reilly can hold on at Fox, his brand is irreversibly damaged. Having the support of an admitted serial sexual assaulter can’t help, even if it happens to be the President of the United States.